Heart disease is the leading cause of death in North America for both men and women and according to the Heart and Stroke Foundation, it is estimated that cardiovascular disease accounts for 29% of deaths in Canada. Although you may have a family history of cardiovascular disease, know that the nutrition and lifestyle choices that you make today, will impact whether those genes will be expressed or not in the future. In other words, heart disease can be prevented. On February 14th, 2014, I was invited by Global Toronto’s News at Noon, to discuss some of these preventative strategies with host Antony Robart. Here is a summary. As always, please see your naturopathic doctor for recommendations specific to your case. The risk factors for heart disease that are within your control include: stress, weight, smoking, excessive alcohol consumption, inactivity, hypertension, high cholesterol, diabetes. The risk factors for heart disease that are not within your control: having a positive family history; or congenital heart disease. Prevention Strategies – Here are some of my tips! Sugar: Avoid the excess sugar. This is the sugar that food manufacturers add to processed foods such as yogurt, sodas, pastries and juices. Minimizing your consumption of processed foods is a must for any health care regimen. According to a recent study, if sugar is 25% of your daily caloric intake, it can double your heart disease risk. To put this into perspective, a 16 ounce bottle of orange juice can contain up to 48 grams or more of sugar. That is the equivalent of 192 calories, in one beverage! Alcohol: For decades, alcohol has been touted as the premiere strategy for heart disease prevention and although some alcohol consumption may offer some protection, there is only so far that this strategy will take you. For men, drink no more than 2 drinks daily and for women, no more than 1 drink daily. If you consume more than the recommended dose on a regular basis, your risk of death from cardiovascular disease will double. Furthermore, you will increase your risk for colorectal, breast and liver cancer. Extra virgin olive oil (EVOO): Include 1 to 2 tbsp each day with your meals. EVOO reduces bad (LDL) cholesterol and raises good (HDL) cholesterol. Nuts: It doesn’t matter which type! Reduces risk of cardiovascular disease by 35%. Aim for a handful of raw, unsalted nuts each day. Garlic: Decreases platelet and red blood cell stickiness and inflammation. Eat 1 clove of fresh garlic daily or add chopped garlic near the end of the cooking process in order to preserve the antioxidant and nutrient content. Tea: 3 cups or more of green tea daily reduces your risk of stroke by 21%, according to one study. Green tea leaves are delicate. To protect the flavour and health benefits on this fine tea, steep in cooler water (70 to 80 degrees celsius) for 2 to 4 minutes. Dark chocolate (70% cocoa): Now this is a superfood! Dark chocolate reduces blood pressure and improves blood flow to the heart and brain. 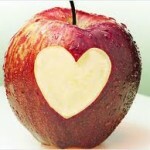 According to studies, about 3 ounces per day is all you need to keep your heart healthy and happy.